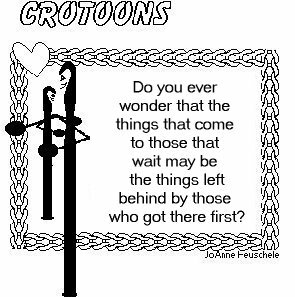 We hope to provide you with exciting information on the latest web developments pertaining to the Crochet 'N' More website as well as two of my original patterns in each issue. Find the perfect gift for any occasion. A large selection of Candles, picture frames and home decor, all with a religious theme. 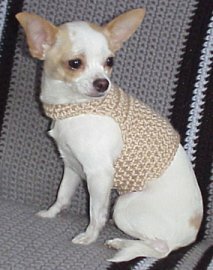 So many of you have requested our Dog Sweater pattern in a smaller size. Click here for Linda's version of the pattern. Name, Email Address and Interests. If so, click here for more information. "How will you spend eternity -- Smoking or Non-smoking?" You are all sons of God through faith in Christ Jesus, for all of you who were baptized into Christ have clothed yourselves with Christ. And I pray that you, being rooted and established in love, may have power, together with all the saints, to grasp how wide and long and high and deep is the love of Christ, and to know this love that surpasses knowledge-that you may be filled to the measure of all the fullness of God. Seek the Lord while He may be found; call upon Him while He is near. Let the wicked forsake his way, and the unrighteous man his thoughts; and let him return to the Lord, and He will have compassion on him; and to our God, for He will abundantly pardon. INTO A MASTERPIECE OF GRACE.."
This quote is from Our Daily Bread - March, 2005 Issue. Three things in life that may never be lost - Peace, Hope & Honesty. Who was the daughter of Abihail? "The Complete Book of Bible Trivia"
Only major page changes will be listed here. KEEPSAKES & CROCHET BY K. & C.
However, these patterns will be added to the Crochet 'N' More website after the next issue is sent out. Decreasing may be referred to as "crocheting the next two (or more) stitches together"
or "decreasing over the next two (or more) stitches". Here are instructions for several decrease stitches. st, draw up a lp (3 lps on hook), YO and draw through all 3 lps. Work a hdc in the next stitch without completing the very last step (keep all three loops on hook) , then hdc in the next stitch without completing the last step. You should have 5 loops on the hook then yarn over and draw through all the loops. Decrease made. over and draw through all the loops. Decrease made. Work a treble in the next stitch (without completing the last step) Work a treble in the next stitch (without completing the last step) Now yarn over and draw through all loops on the hook. Foundation row and last row of an afghan aren't the same length. I never block afghans but many crocheters do. You can steam block afghan squares by placing a cloth over the square and steaming it with an iron. Do not press it... just work with the steam and then let the square lay flat until it cools. Be sure to use a cloth between the iron and the finished piece and be extra careful if you decide to block "acrylic" yarn items as it could melt if overheated. Some people block by just steaming over the piece without actually touching the iron to the project but if you decide to actually press the iron onto your project I suggest testing a scrap swatch first. If your stitch count is correct then your tension is to blame. If your foundation row is always narrower than your last row, try beginning your afghan with a larger hook size and then changing to a smaller size later on. Since your foundation row is always wider you should begin with a smaller hook and change to a larger one. Hi' The cutie's name is Mickey. She is a pom which gets a hair cut each spring when it warms up. 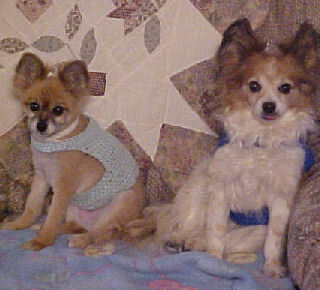 My mom is making her your cute sweaters for the cold snap till summer! Thank you for a wonderful pattern for my first crochet project. I made the sweater for my mini poodle mix, so I did use the alterations. The pattern was easy to follow and since it only incorporated beginning stitches, I was able to concentrate on the pattern. The sweater is a success!! I've started your table runner pattern in Aunt Lydia's denim cotton yarn in yellow. I'm making it for my kitchen table and it looks great on my table. Hi! I figured it out. I first wrote you about this dilemma when making this scarf. The last row of this pattern ending doesn't match the first row, making the scarf look off balance. I know you mentioned about the chain stitch, and you were right. But the important factor...A smaller crochet hook when doing the last row(I used a G 6-4.25mm) It made a big difference. Thought you could use this information to enhance your website. Great hearing from you. Talk to ya soon. Hi, I would love to donate baby items, but I can't find any here in Pennsylvania. Warming Families has chapters all over the US. shows that the UK lists a yarn over as "yoh or yrh". Divisible is a term used when making a foundation chain. If your pattern says to make your foundation chain divisible by 4 then your foundation chain could be 8 chains, 12 chains, 16 chains, 20 chains, etc. Some patterns will say a "multiple of" which means the same thing. Do you have Lacy Doily instructions/directions in diagram not text? I'm sorry but I do not have any symbol crochet patterns on my website. I'm on dial up also... so I do know what you mean. I haven't noticed my pages timing out or anything though. The current newsletter is never listed on my website anywhere. My newsletters are very large so keep in mind if a graphic fails to load you can right click and choose "show picture" to see what is there. for info on graphs and charts. Drop me a line if you have further questions. When a pattern refers to a "space" it means you work into the little hole below the actual stitch. "dc in next ch-2 sp "
means you work one double crochet into the space or hole below the next 2 chains on the previous row. WHAT do you have in your eye if you have a bee in your hand? Answer: Beauty. After all, beauty is in the eye of the bee-holder. THE PARENTS of a college freshman gave him a Bible when he left for school, assuring him it would be a comfort while he was away from home. Soon after he arrived at school, the student began sending letters asking his parents for money. They responded by telling him to read his Bible--citing chapter and verse. When the student came home for semester break, his parents told him how disappointed they were that he hadn't been reading the Scriptures. "How did you know?" he asked. "Because we used $20 bills as bookmarks for the passages we wanted you to read." Irving was just coming out of anesthesia after a series of tests in the hospital, and his wife, Sarah, was sitting at his bedside. His eyes fluttered open, and he murmured, "You're beautiful." Flattered, Sarah continued her vigil while he drifted back to sleep. Later he woke up and said, "You're cute." "What happened to 'beautiful'?" Sarah asked. "I guess the drugs must be wearing off," he replied. My wife and I were browsing in a crafts store when I noticed a display of country-style musical instruments. After looking over the flutes, dulcimers and recorders, I picked up a shiny, one-stringed instrument I took to be a mouth harp. I put it to my lips and, much to the amusement of other shoppers, twanged a few notes on it. After watching from a distance, my wife came up and whispered in my ear, "I hate to tell you this, honey, but you're trying to play a cheese slicer." Vacationing in Alaska, I couldn't help but notice all the warnings about bears posted in campgrounds, visitors' centers and rest areas advising people not to feed the bears, how to avoid bears, what to do if a bear sees you, what to do if a bear attacks, and so on. My favorite, however, was a hand-lettered sign on the door of a small gas station in a remote area. It said: "Warning! If you are being chased by a bear, don't come in here!" A wife was making a breakfast of fried eggs for her husband. Suddenly her husband burst into the kitchen. "Careful .. CAREFUL! Put in some more butter! Oh Good Grief! You're cooking too many at once. TOO MANY! Turn them! TURN THEM NOW! We need more butter. Oh Good Grief ! WHERE are we going to get MORE BUTTER? They're going to STICK! Careful ... CAREFUL! I said be CAREFUL! You NEVER listen to me when you're cooking! Never! Turn them! Hurry up! Are you CRAZY? Have you LOST your mind? Don't forget to salt them. You know you always forget to salt them. Use the salt. USE THE SALT! THE SALT!" The wife stared at him. "What on earth is wrong with you? You think I don't know how to fry a couple of eggs? The husband calmly replied, "I just wanted to show you what it feels like when I'm driving. A young private sought permission from his Commanding Officer to leave camp the following weekend. "You see," he explained, "my wife`s expecting." "Oh..." said the Officer, "I understand. Go ahead and tell your wife that I wish her luck." The following week the same soldier was back again with the same explanation: "My wife's expecting." The Officer looked surprised. "Still expecting?" he said, "Well, well, my boy, you must be pretty bothered. Of course you can have the weekend off. "When the same soldier appeared again the third week, however, the Officer lost his temper. "Don't tell me your wife is still expecting!" he bellowed. "Yes sir!" said the soldier resolutely, "She`s still expecting." "What on earth is she expecting?" cried the Officer. "Me." said the soldier simply. A retired man who volunteers to entertain patients in nursing homes and hospitals went to Maimonides Hospital in Brooklyn and took his portable keyboard along. He told some jokes and sang some funny songs at patients' bedsides. When he finished he said, in farewell, "I hope you get better." One elderly gentleman replied, "I hope you get better, too."